The possibility that anyone else besides Rachel Bilson would play the Mother. Seriously, it would be pretty hard for Ted to top Cindy - and we haven't even met her character yet! Who could be a better candidate to be Mrs. Mosby? Anyone? Anyone at all? So far it is unclear if Rachel is sticking around, just a momentary speed bump on Ted's epic journey to find the woman of his dreams, or if Cindy's character is open-ended. 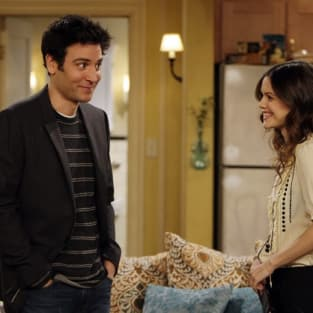 Producer Craig Thomas did say this legendary 100th episode would represent "the closest Ted's ever come" to discovering the identity of his future wife. So there's hope! Here are two promotional shots of Bilson with Ted (Josh Radnor). Cute couple, right?